Munias have become our latest favourites. They are mostly found in open farms and a lot of them can been seen gathering nesting material these days. During our frequent trips to Manchinbele and Valley School over the past few weekends, we have had abundant sightings of the Black Headed Munia, Scaly Breasted Munia, White Throated Munia (Indian Silverbill) and the White Rumped Munia. 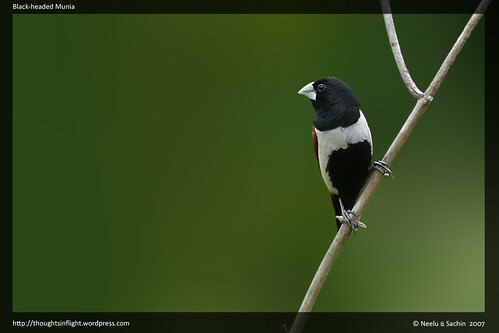 This picture of the Black Headed Munia was taken at Valley School, Bangalore. Hi, I regularly read your blog. Thanks so much for the detailed info. Have been to the MiniForest and Madivala Lake – directions are great! Thanks! Glad that the information was helpful for you. You have an interesting blog going on, we are yet to get a glimpse of any of the mighty cats. It has been a bit busy offlate for both Neelu and me. Plus the weather/light conditions haven’t been very conducive for birding. Hope to get back to it soon. fantastic shots man..i have started visiting ur blog more frequently and also started writing now after reading lot of good stuff from people around blr..
Could you let me know where in Bangalore is Valley School. « Flying the good times !! !